so I have the following component that is a dropdown list created using react-select. the options variable is the default one from the docs. I actually need to replace its values by each meal category available. To do so, as you can see, I need to create an array of objects with a value and a label. How can I take advantage of this.props.meals to get my options array of objects ? EDIT: multiple meals can have the same category, and I need each category to only appear once in the options. You only need the "name" property so when you map through meals, simply retrieve it. Then upper case the first letter. You can use getOptionLabel and getOptionValue props. When user first go to "/": home page will be loaded. When user logs in or registers successfully, the user will be redirected to the home page, only this time the "Register" and "Login" buttons are replaced by a "Logout" button. This action is caused by a child prop that is passed down from the App.js. When the user first goes to "/", Home page is loaded with isAuthenticated = false. When the use logs in or registers successfully, Home page is reloaded with isAuthenticated = true. However, if I refresh the page, Home page is loaded with isAuthenticated = false again so it loses all the items that are supposed to be rendered (in this case, the notes). After that, if I click on the browser to go back to a login or register page then, without filling in any info to log in or register, go forward to the home page again, the home page is loaded normally with isAuthenticated = true. => For some reason, the state isAuthenticated is not consistently passed to the Home page. const auth = await Auth.currentAuthenticatedUser(); // this is a function that calls an API to get the current user's details. 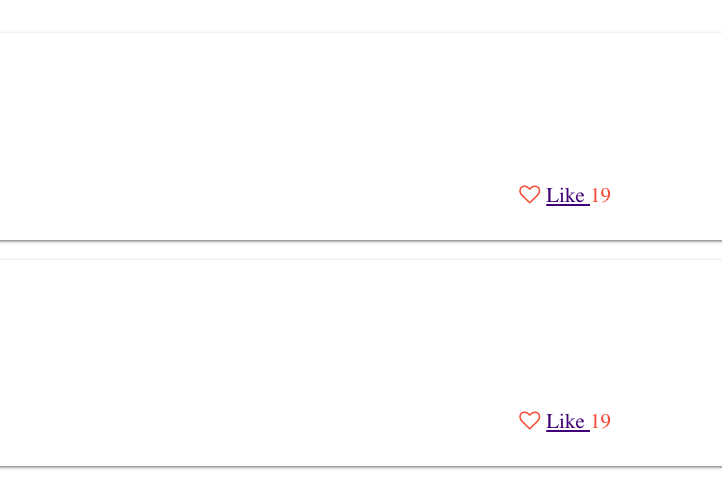 I'm making a like component, and redux is having an issue upvoting the like count. Along with this reducer, the console logs the data so im unsure why its not allowing me to upvote a count. 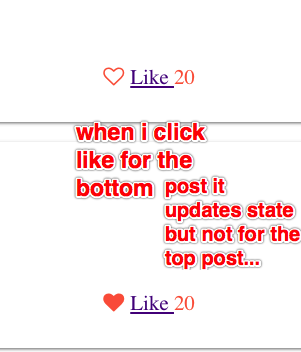 Redux is not updating the like count when clicking the like button, and yes the api backend is working and i can see the like count updated on the backend, but its not updating on front end. // Pass id to the DeletePost functions.